be prepared to make a profit. The most versatile and flexible prep station on the market, the Mobile Prep Station is perfect for adding capacity and flexibility to your finishing operations-without overextending your budget. Tests show the Mobile Prep Station – complete with it’s multi-stage filtration and a patented recirculation design-removes 99.78% of paint overspray from the air. 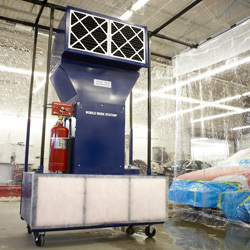 By using cleaned, recirculated air, you eliminate the need for costly ventilation modifications or air make-up systems and reduce energy costs by utilizing your shop’s existing heated or cooled air. And removing airborne particles at the source increases productivity by reducing rework and clean-up as well as providing a healthier work environment for employees. Engineered and manufactured to deliver performance, reliability and safety for your operation, this portable prep station / booth, when used with its attached drapery system, provides a clean, enclosed atmosphere-anywhere in your shop. As seen in Auto Body Repair News, Bodyshop Business Magazine and FenderBender. Model No. 4950 – Our base model unit. It features a ¾ HP 2400 CFM motor/fan assembly. Model No. 4960 – This unit features a ¾ HP 2400 CFM motor/fan assembly and an on-board dry chemical fire suppression system. Model No. 4900**-This unit features a ¾ HP 2400 CFM motor/fan assembly and a complete drapery enclosure system. Model No. 5450 – This base model unit features an upgraded 1 ½ HP 3500 CFM motor/fan assembly, advantageous for working with heavier materials or higher volume usage. Model No. 5460 – This unit features an upgraded 1 ½ HP 3500 CFM motor/fan assembly and an on-board dry chemical fire suppression system. Model No. 5400**-This unit features an upgraded 1 ½ HP 3500 CFM motor/fan assembly and a complete drapery enclosure system. a Certificate of Compliance is provided for each unit. Keeps the air in your shop clean and clear. The Mobile Prep Station® moves where you need it, allowing you to prep parts anywhere on the floor. Models without the fire suppression system or drapery enclosures can be upgraded after purchase. 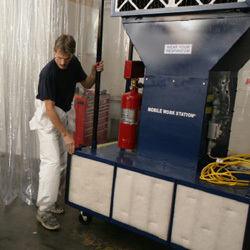 NFPA regulations require a drapery enclosure and a dedicated fire sup-pression system for prep stations used for painting operations. 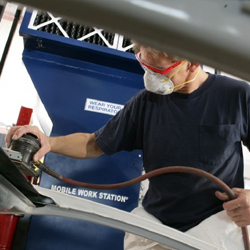 For information on our mobile limited finishing work stations, CLICK HERE.